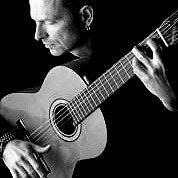 Ottmar Liebert is a German-born composer and guitarist, born to a Chinese-German father and a Hungarian mother. As a child, he spent most of his time traveling Europe and Asia with his family. Ottmar leads an ensemble called Luna Negra (“Black Moon”), which has gained popularity performing as a touring band and recording music albums in a “Nouveau Flamenco” style.